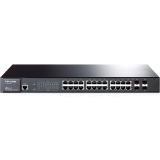 It provides 24 gigabit 10/100/1000BASE-T combo gigabit ports and also it has 4 combo 1000BASE-X SFP slots giving you greater network flexibility. It also has different security features like Access Control Lists (ACL, L2 to L4) and destination MAC address, IP address, TCP/UDP ports and even VLAN ID. It also features 802.1X Authentication and Radius. It also supports IPv6 which is useful for next generation network. The TL-SG3424 supports various user-friendly standard management features, such as intuitive web-based Graphical User Interface(GUI) or industry-standard Command Line Interface(CLI), either administration traffic can be protected through SSL or SSH encryptions. This switch has some QoS policies, by which administrator can designate the traffic for the specific user according to the requirement. TL-SG3424 Features: Windows Vista- Windows XP Professional- IEEE 802.3x- Mac- IEEE 802.3ab- IEEE 802.3u- Console Port- AUTO Negotiation/AUTO MDI/MDIX- 100/1000 Mbps SFPAccess Control List - Screens Traffic from Illegal MAC or IP Addresses- Windows 7Quality of Service (QoS)- IEEE 802.3z- IEEE 802.1x- IEEE 802.1wBandwidth: 48 Gbps- IEEE 802.1d- IEEE 802.3ad- UNIX- Netware Auto MDI/MDIXStandards and Protocols:- IEEE 802.3i- Linux- 24x 10/100/1000 Mbps RJ45Operating System Compatibility:- IEEE 802.1s- IEEE 802.1q- IEEE 802.1pPort Mirroring IEEE 802.3x Flow Control Includes: Switch, Power Cord, Quick Installation Guide, Resource CD, Rackmount Kit, Rubber Feet"